Welcome to SUNSTATE MEDICAL GROUP, INC.
Our Physicians Group was founded in 2003 by Dr Victor R. Roberts , M.D with the vision of creating a medical practice that treats every patient with dignity and first-rate care. The nurses and office staff at our Physicians Group are highly-trained and exceptionally friendly. We understand that for many, visiting a doctor can be a stressful experience. Our comfortable surroundings and compassionate medical professionals will ease your fears. Victor R. Roberts , M.D earned a Bachelor of Medicine and Bachelor of Surgery degree in India form Kakatiya Medical College, University of Health Sciences in 1996. He successfully completed his Internal Medicine residency at the Albert Einstein University, Bronx- Lebanon Hospital Center, New York 2003. 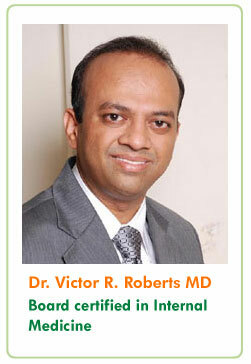 Dr. Victor R. Roberts is board certified by the American Board of Internal Medicine Certification Board. Rr. Victor R. Roberts a proud member of the Florida Medical association and Seminole County Medical Association has received honors for his work with treating patients struggling with complex Medical and Geriatric Issues.